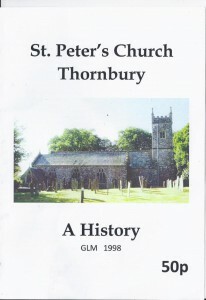 Thornbury Church is very old. 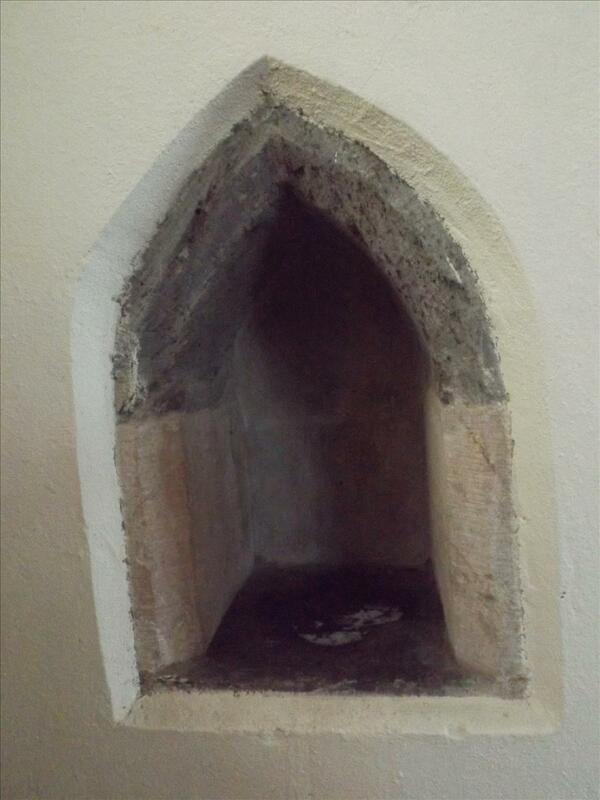 Records show that an early Rector of the Church was John de Cornu who was instituted in April 1275 but it is known that the church had been built at least 100 years before this date as stonework in the present south doorway is dated about 1150. 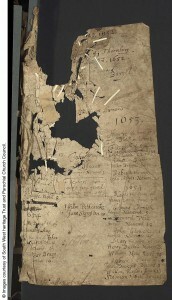 However, the dedication to St Peter is not recorded before 1491. It was partially rebuilt in the 1330s, and retains much 14th century work but all that remains of the original structure is the Norman doorway. 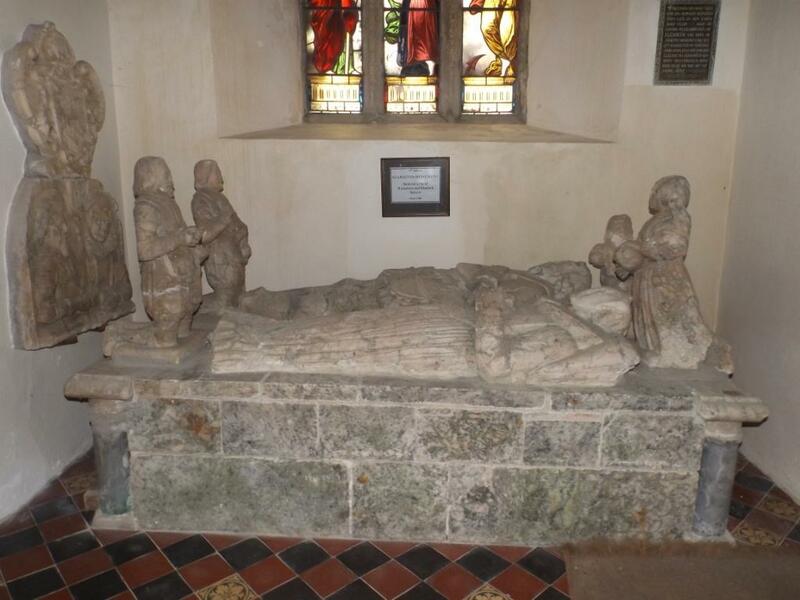 The Cornu family was closely associated with Thornbury and its church from at least 1135 and it is one of the Cornu descendent, who married a Speccott in around 1340, who is the ancestor of John Speccott who inherited Thornbury Manor 150 years later. 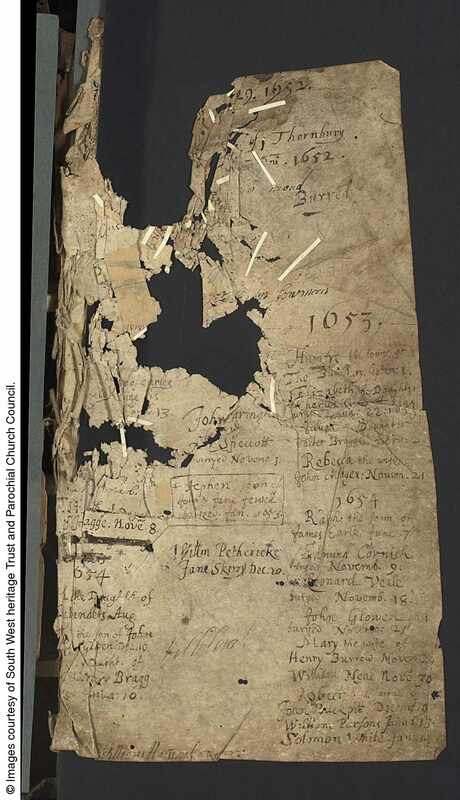 Moving on to 1386, there is a report of the Dilapidation enquiry which reported that the chancel of church was ruinous and the church defective in books and ornaments. 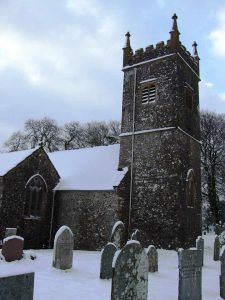 During the time that Richard Beer was Rector (1411 – 1452) it is thought that the church was enlarged and the north aisle built. The next significant event in the history of the church seems to have occurred around 1542 as on 19th April 1542 Bishop Voysey invited the faithful “to contribute generously towards the rebuilding of Thornbury church, which recently owing to a sudden outbreak of fire, happening at the very onset of night, was completely reduced to ashes.” Apparently during restoration in 1877 some charred timbers were found in the stonework indicative that a severe fire had at one time affected the building. 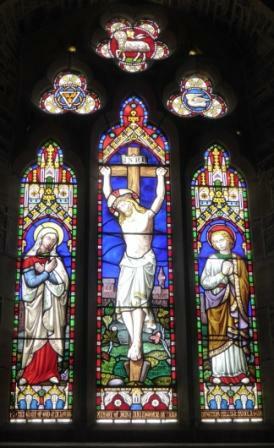 To support this rebuilding theory, the south windows of the nave are of the Tudor period. 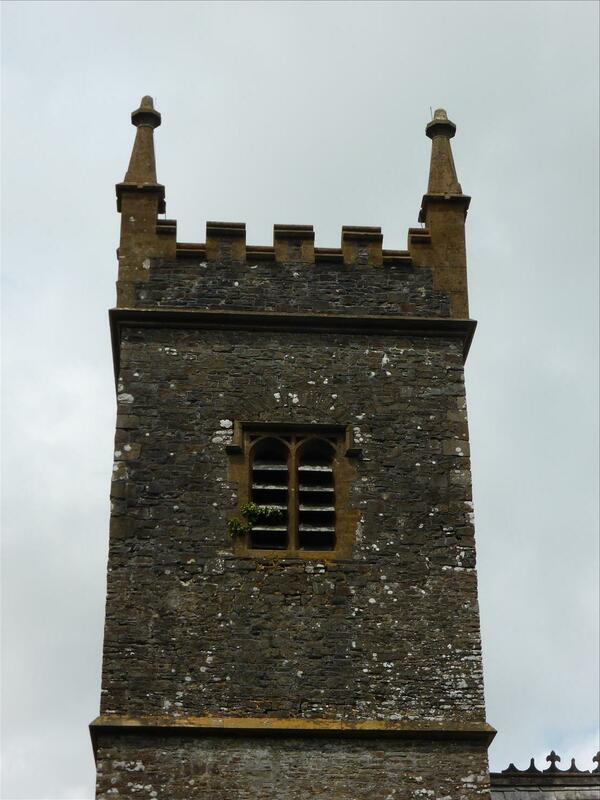 However, despite this destruction, in 1553 it is recorded that Thornbury church had four bells at a time when Black Torrington, Bradford and Cookbury each only had three. 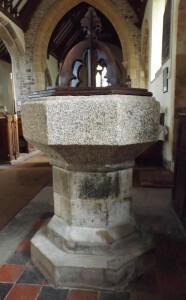 One of the four was still present in 1872. It seems likely that the Speccott tomb in the church was placed there in the 1590s and was originally under the arcade between the chancel and the north aisle. In 1760 the Dean of Exeter made a Visitation and reports that there are three bells in the church and a feast is held on the Sunday after St Peter’s Day. He also reports that a deer park north of the church, full of timber, was destroyed in the great storm of 1703. 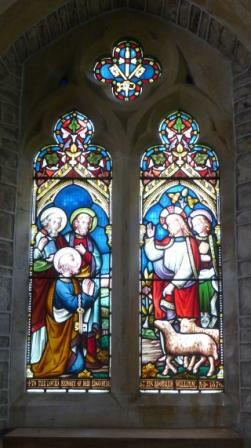 He also notes that arable land has been improved with sand from Bude. It seems that nothing changes. 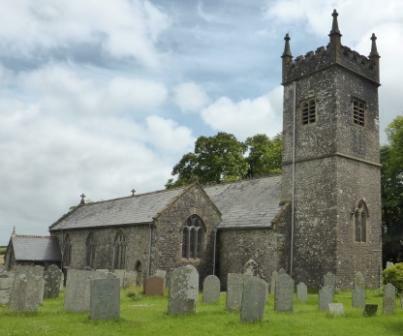 In a report on the church in 1849 it was recorded as having a low tower with four low pinnacles and three bells and the Speccott tomb was reported as being in a ruinous condition and had formerly had a canopy over it supported by four ionic columns. In 1873 Joseph Graham a London Barrister bought the manor estate and set about ‘improving’ the old church. 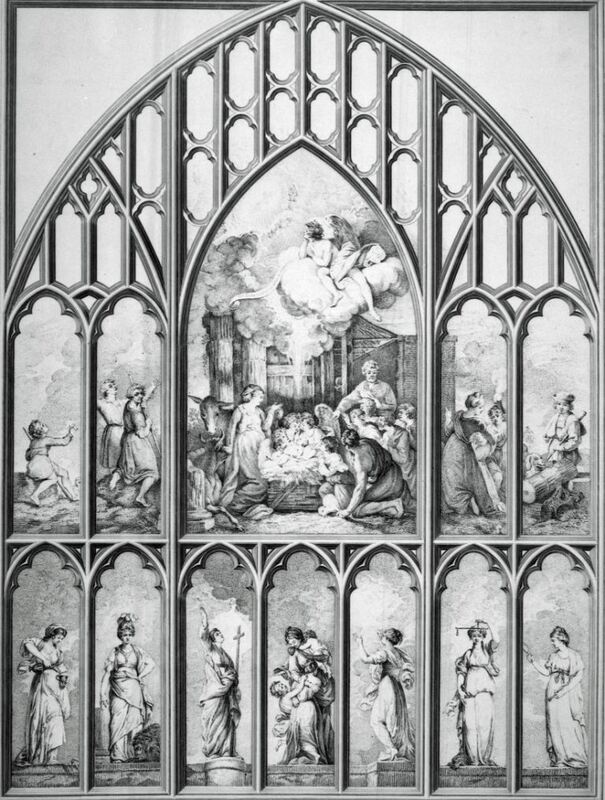 He rebuilt the north aisle putting in new stone mullions and tracery to the windows, inserting a new window at the west end and probably building on, at the north east corner, the present vestry at a cost of £400. At the same time the Revd William Edgcombe and his family undertook the restoration of the chancel including adding more new windows and 6 stone corbels in the shape of heads to support the new roof of the chancel. The costs for this were £450. It was at this time that the Speccott memorial was moved to its present location. 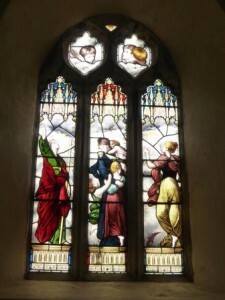 At the same time a further £600 was raised to increase the height of the tower by 5 feet, re-roof the nave, south transept and porch with Delabole slate, put in a new window in the east side of the transept and move the font from the west end of the north aisle to its present position. 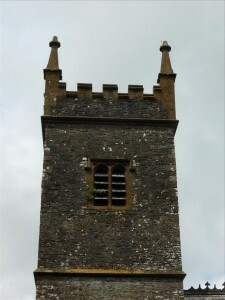 The three old bells were taken from the tower and used to recast a new peel of five at a cost of £208 less £138 for the cost of the old metal. 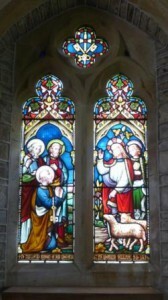 Unfortunately, during this restoration most of the original features of the church were lost. The £600 spent on the roof and other improvements in 1873 are equivalent to about £55,500 in today’s money. In 2012 the roof again had to be replaced at a cost of £300,000. Details of the stained glass windows (including their dedications) and memorial plaques in the Church can be found in the Gravestones Project section. 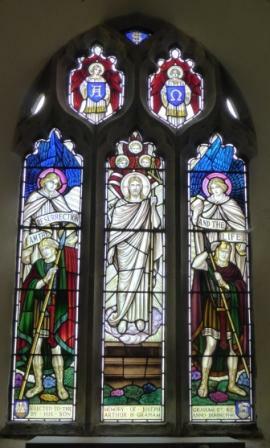 The stained glass window on the north side of the north aisle, over the Speccott memorial, was placed there in memory of Mrs Elizabeth Graham in 1897, and was made by Beer of Exeter. 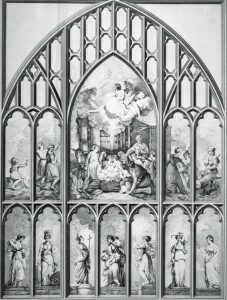 It is a copy of the figures of Faith, Charity and Hope which form part of the west window of New College, Oxford, which was designed by Joshua Reynolds in 1779. The current church consists of chancel, nave, south transept (known as the Butter Market), north aisle with two arches resting on granite pillars in the nave, and two pointed arches dividing it from the chancel, a south porch, and a west tower with five bells, details of which are set out below. In the chancel are six corbels with heads of a knight, a monk, a king, a queen, our Lord, and the Blessed Virgin. 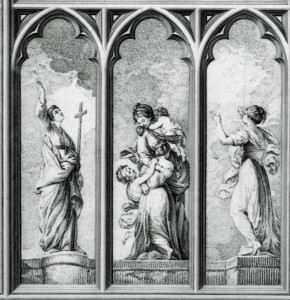 At the east end of the north aisle is the Speccott family monument. On a high tomb over which there was originally a rich canopy supported by marble pillars are two full-size recumbent effigies of a knight and lady and two other smaller figures kneeling. The effigies are of alabaster and beautifully executed. The male figure is in armour, bare headed with moustache and pointed beard, the curled hair rests on the shoulders and is turned over the forehead. The female figure is arrayed in Elizabethan costume with ruff. Of the two smaller figures the male has a cloak over his shoulders and holds a skull in his hands. The female wears coif and veil. The monument bears no inscription but it is supposed to be that of Sir John Speccott (son of Humphrey Speccott and Elizabeth daughter of John Walter), who married first, Elizabeth daughter of Sir Peter Edgcomb by Margaret, daughter of Sir Andrew Luttrell. 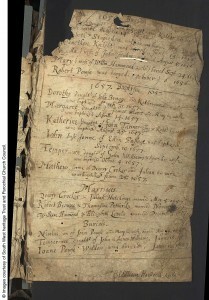 His second wife was Jane, daughter of Sir William Mohun of Hall, Cornwall. He married a third time. 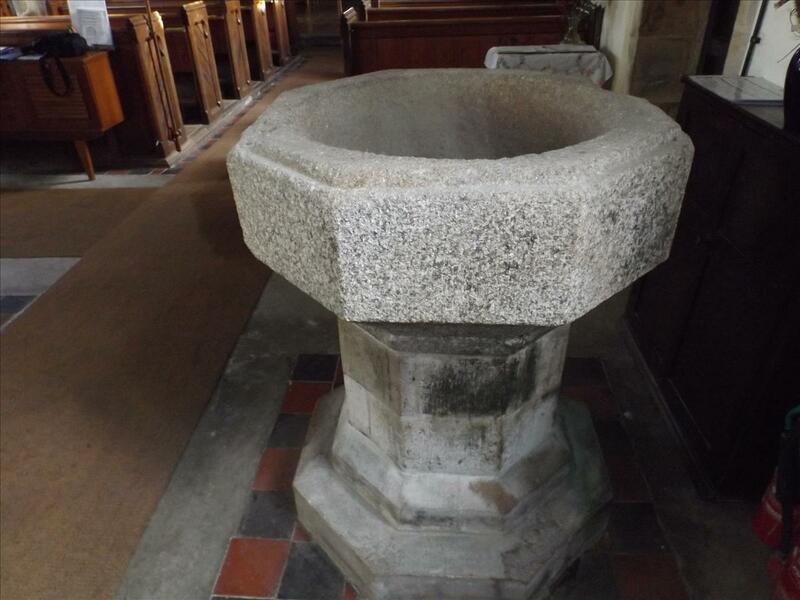 On the side of the north aisle is a piscina with drain. 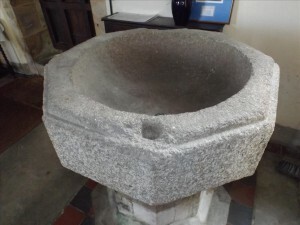 This was used for rinsing the chalice. This is adjacent to the Speccott tomb. The bowl of the font is said to be 13th century; other than the south entrance doorway, this is all that remains of the Norman church. 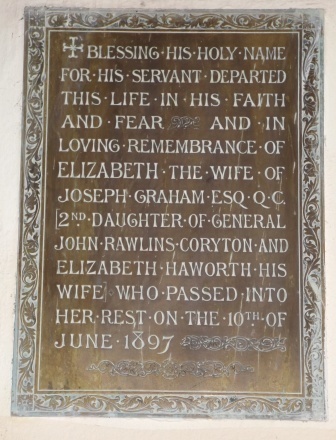 In 1693 John Johns of Brendon married Elizabeth Cole and the oldest tombstone in the churchyard is a memorial to this Elizabeth and three of her children in 1702. 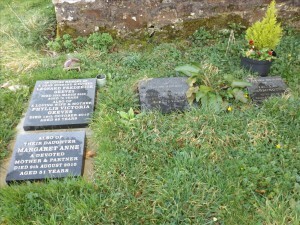 It is situated near to the main church door and is designated as Grave 10.03 in the Gravestone Project. Much of the inscription is extremely hard to read. 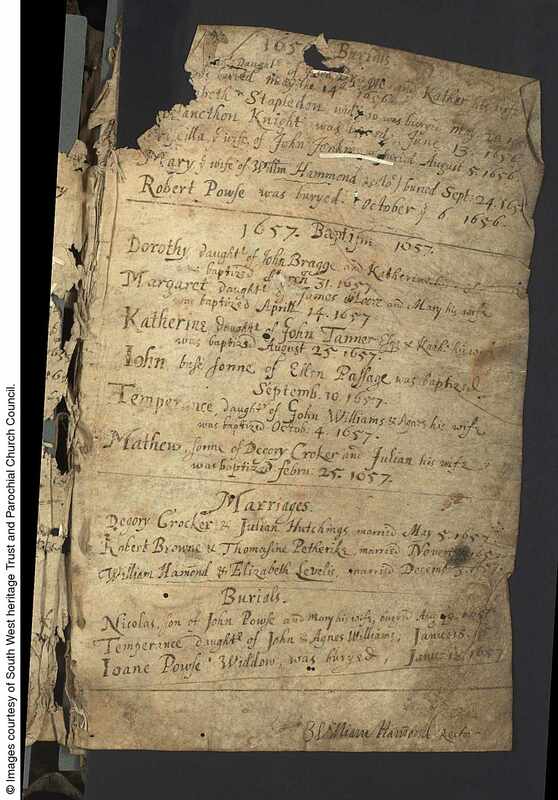 This is the index entry for the death of Elizabeth in 1702 (the index was compiled based on Christian names rather than surnames.) The full entry has not yet been found in the records. 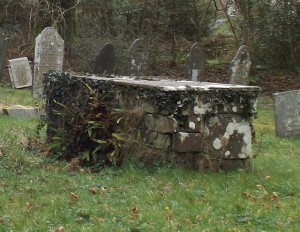 The graveyard is approximately triangular with the church sitting in the middle of the long side. It runs roughly north to south with the church aligned east to west as is usual. There are 333 tombstones in the graveyard and a number of unmarked graves. Not all stones are legible and there does not appear to be a record of the older burials although there is one for the newer ones. 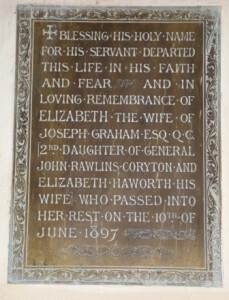 In addition, there are 13 plaques and three dedicated windows inside the church as well as the Speccott tomb. 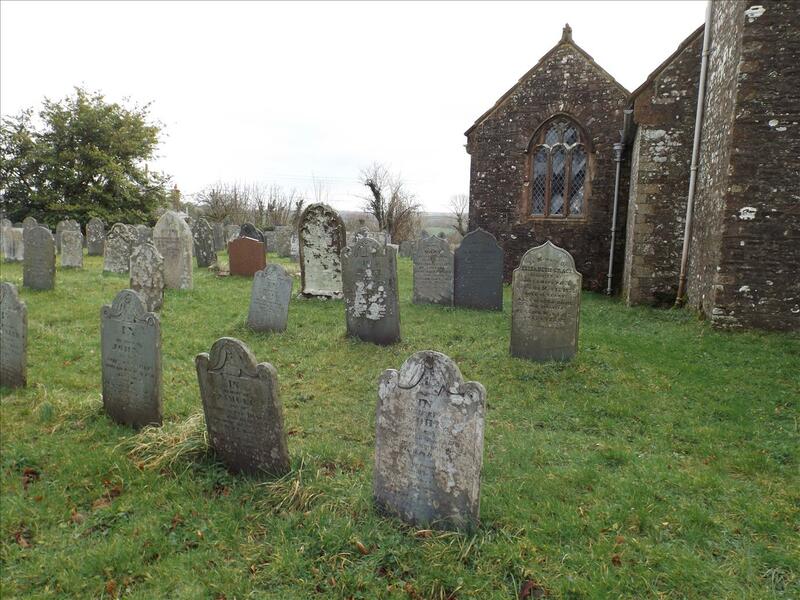 See the Gravestones Project for more details of the headstones and inscriptions. 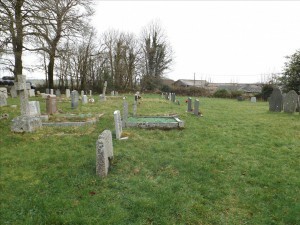 The oldest part of the graveyard is to the south of the church and here graves are roughly aligned in rows at the western edge but as you move eastwards the rows are more irregular and some are only part rows. At the extreme eastern edge the graves are more random. As convention dictates, the graves on the west side of the south door to the church have their headstones facing east whereas unusually, the majority of those on the east side of the door face to the west. 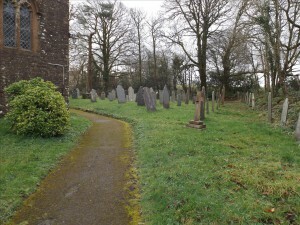 The graveyard to the north of the church is in two halves. That on the west side adjacent to the road is more recent and is approached by way of a stone archway which was formerly the entrance to the village pound where any stock found wandering were impounded and the owners had to pay a fine to get their animals back. 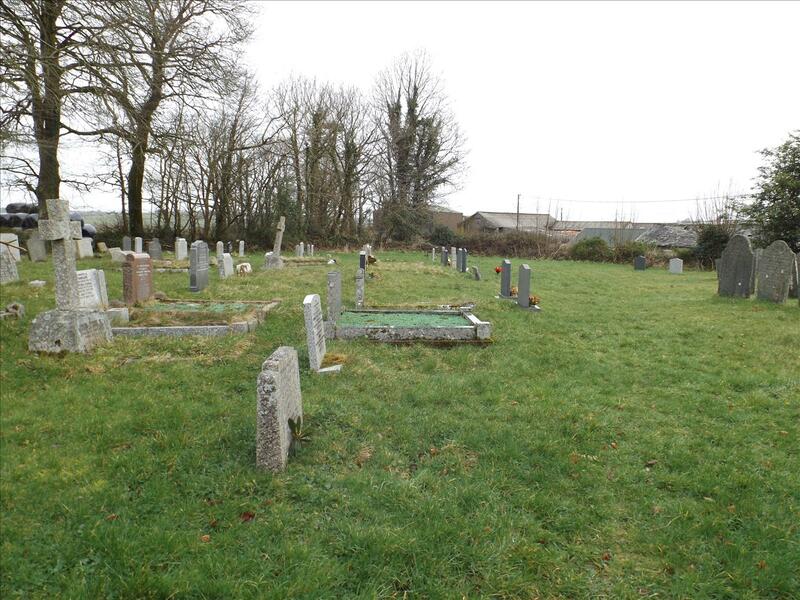 These graves are in clear rows with the headstones facing east. 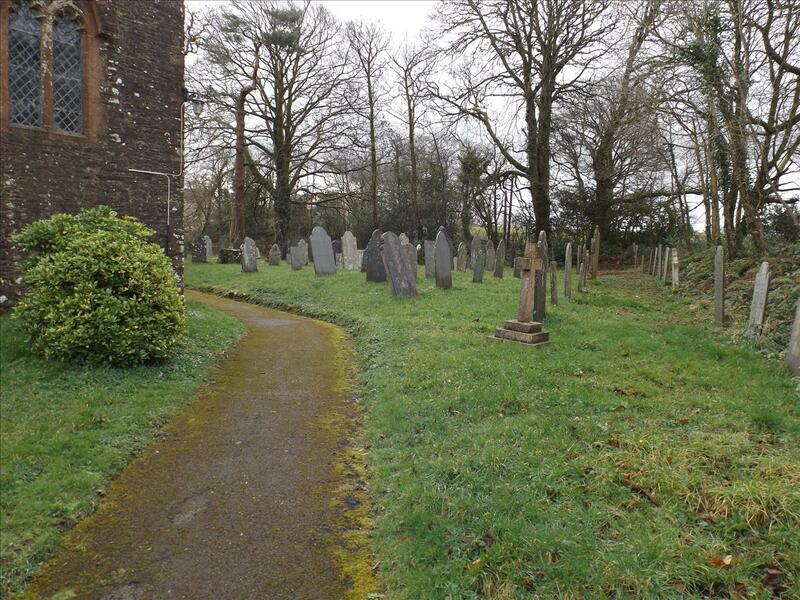 To the east of this new part is an older part of the churchyard and again the rows are less well defined. The first rows face east but then the rows start to mainly face west with the odd one facing east and on top of another grave. One stone has been laid flat. As you get nearer to the eastern boundary the rows are poorly defined. 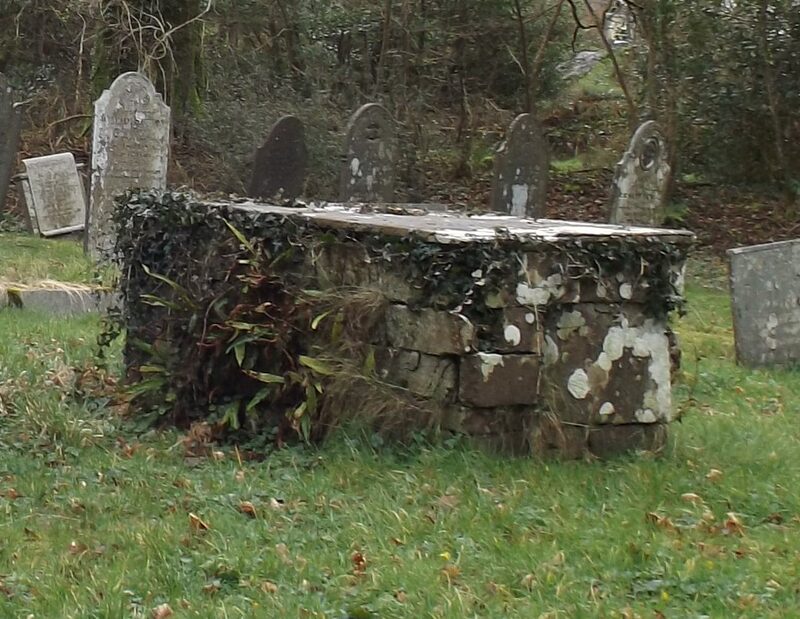 There are also some headstones leaning up against the rear wall. It is assumed that these stones have fallen in the past and have been removed here for safety. In the corner between the north wall of the tower and the west wall of the north aisle is an area set aside for the scattering of ashes. 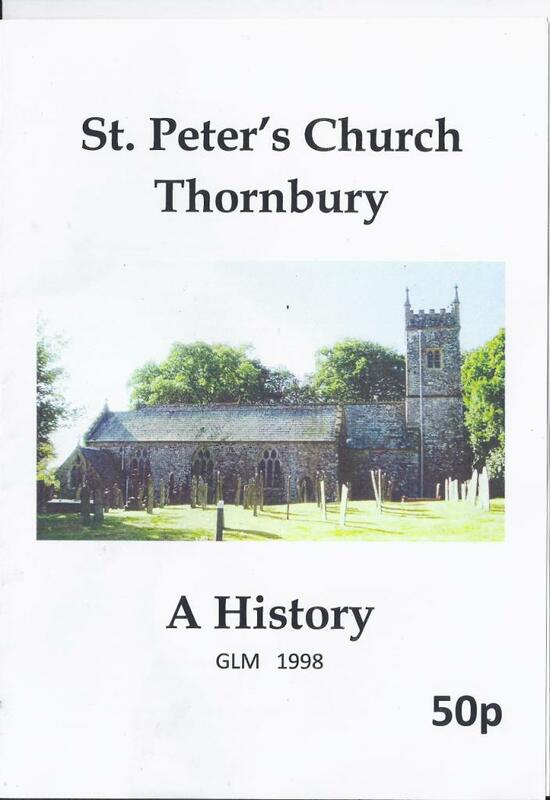 A short history of the Church is available as a pamphlet – copies are held in the Church, and are priced at 50p. Contact the Editor to arrange payment plus P&P if you are not local and would like one sent to you. Thornbury is part of the Black Torrington Benefice: you can find details of the other four churches in the Benefice and their times of service on their website.